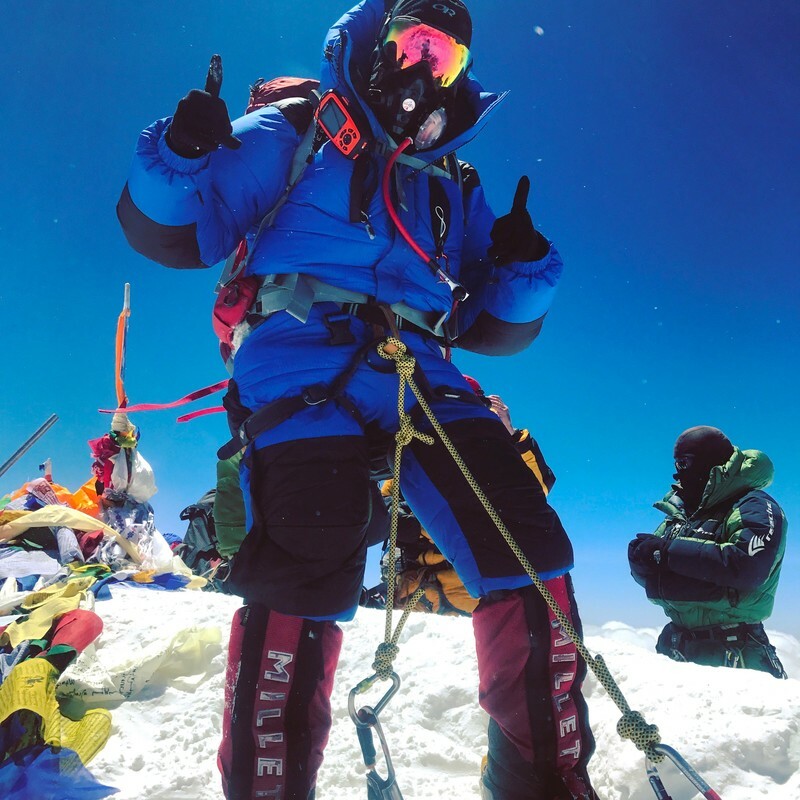 Holly Budge is a British adventurer, mountaineer and public speaker, having just returned from the roof of the world, successfully summiting Everest on May 22nd 2017.​She documented her expedition daily on social media, using her hashtag #everesteveryday, giving an intimate insight into the world of big mountain climbing and posted a photo directly from the summit. 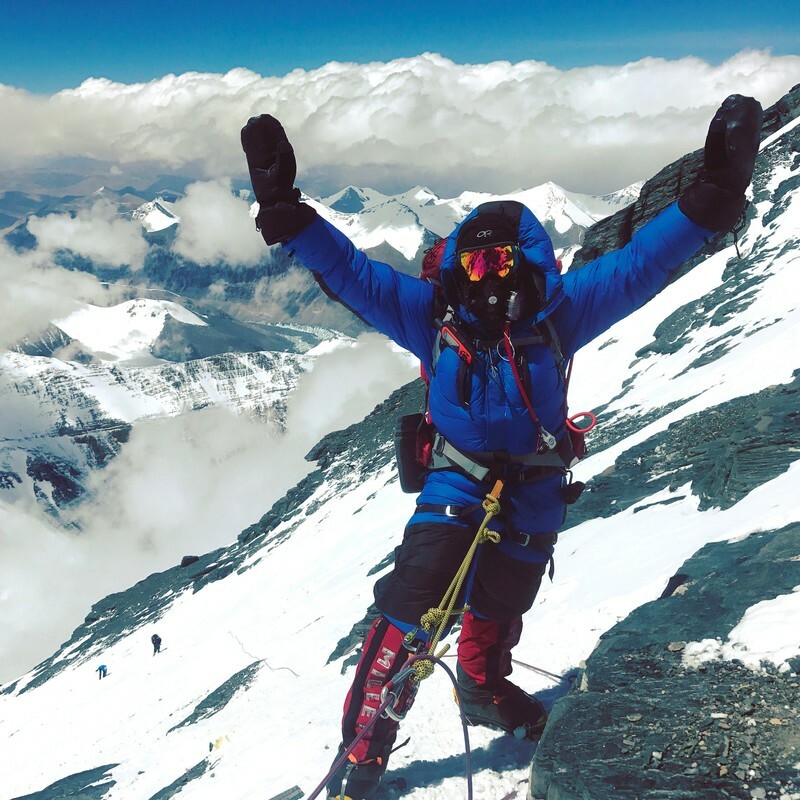 Holly on the summit of Everest 2017. She posted this photo directly from the summit. Her passion for adventure is evident with two world records under her belt so far, including being the first woman to skydive Everest and on another expedition, racing semi-wild horses 1000kms across Mongolia in just 9 days. ​She works as a big mountain expedition leader and last year successfully led an expedition on the technical Ama Dablam (6812m) in Nepal. 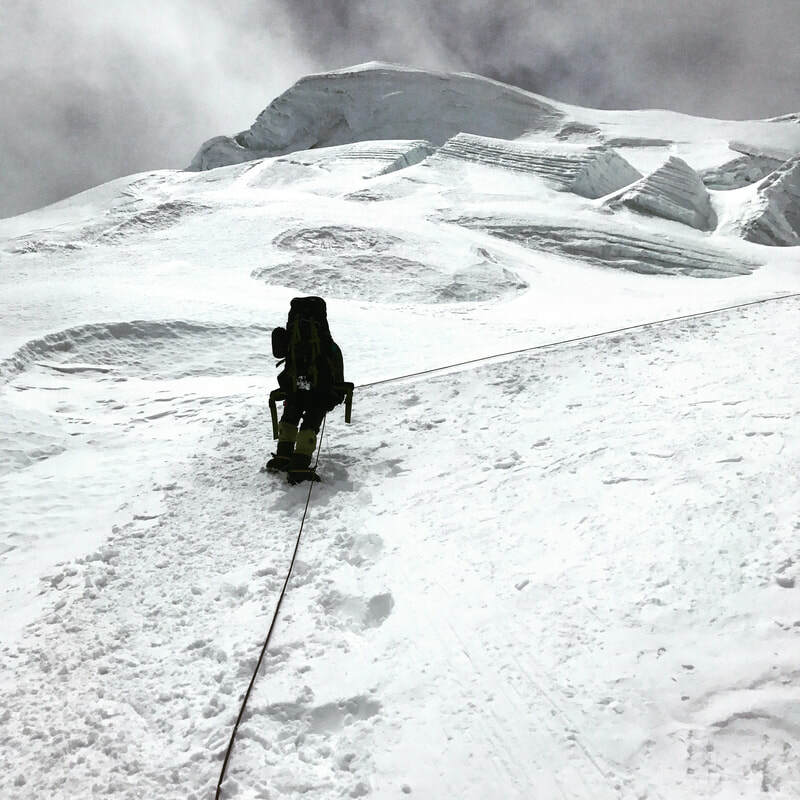 Other climbing achievements include summiting Cho-Oyu (8201m), Baruntse (7129m) and snowboarding from the summit of Mera Peak (6476m) in Nepal. More recently, she made a successful first ascent in the Mongolian Altai Mountains. 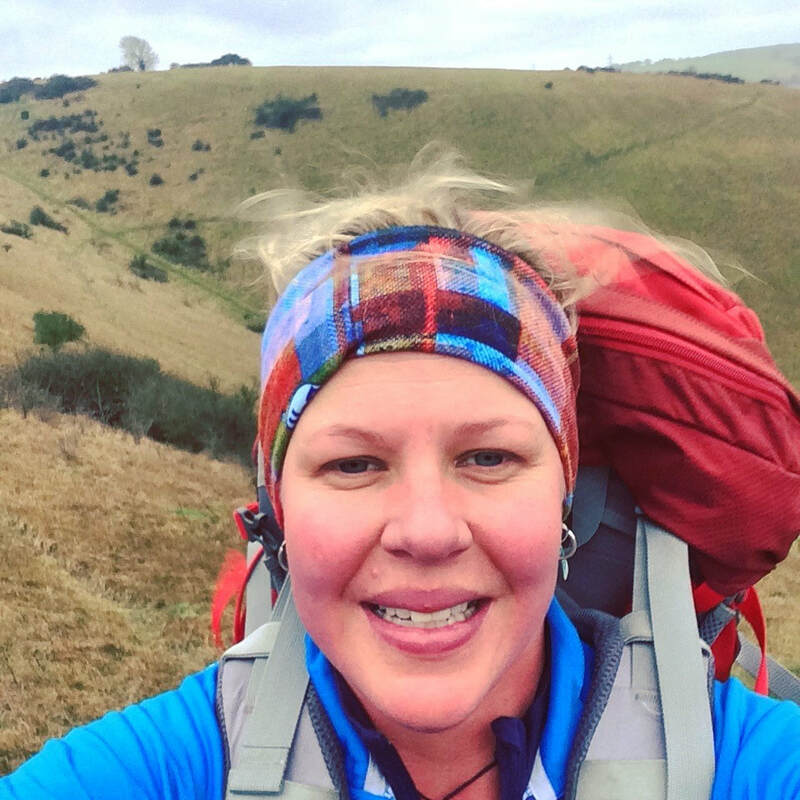 Holly has raised over £300k for a diverse range of charities through her adventures, including for her own award-winning charity ‘How Many Elephants’. Her vision is to empower and motivate others to daydream, meander, run, climb and jump into their own adventures of self-discovery, and in doing so, learn that with self-belief, determination and resilience, even the biggest of challenges can be overcome. Holly is an energetic and engaging motivational speaker who talks passionately about her diverse achievements in the outdoors. ​Holly uses a few simple tactics to succeed on the big mountains. On the first few mountains I climbed in the Himalayas I didn’t train hard enough. I pretty much relied on my base fitness. On reflection, that was pretty arrogant and very ignorant. No mountain is easy but the turning point came when I climbed Ama Dablam and it totally kicked me. I hadn’t trained enough for it. 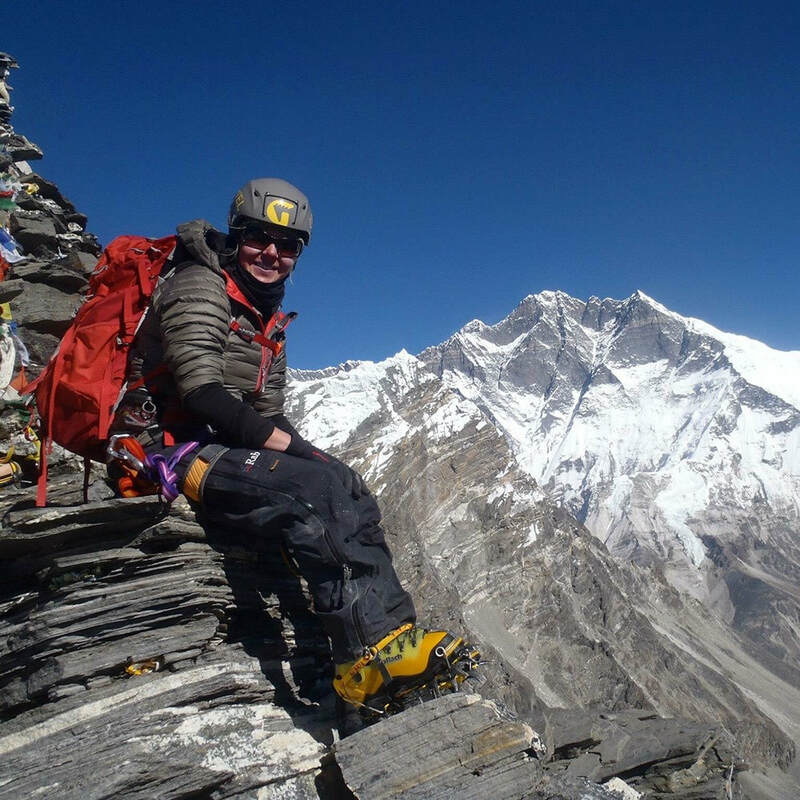 Ama Dablam is rock climbing for 6000 metres and then technical mixed climbing right up to the summit. It was a slow 24-hour summit push and it was tough! When I got back I vowed that wouldn’t happen again. That’s when I joined up to a dedicated training programme by Uphill Athlete. I trained six days a week and with a personal trainer twice a week. My nutrition got much better. Before I was just eating for the sake of eating, then I learnt how to fuel my body and had so much more energy. There’s this expression, ‘train hard, fight easy,’ but what I realise now is, you’ve got to train hard, and regardless of who you are, on any big mountain, you’ve got to fight hard. ​Life in the mountains is without clutter, every piece of equipment has a role, every object has a place and thoughts have purpose. A lot of us want to simplify our lives. This is stripping it down to the absolute bare bones of what I need and as I’ve got to carry that on my back, it’s got to be essential. Everything you need to survive is on you, or in your backpack. There’s no room for thinking about anything else but the task at hand and that’s the reason why I love mountaineering, it’s a very simple life. Simplicity – Everything I need is in my backpack! 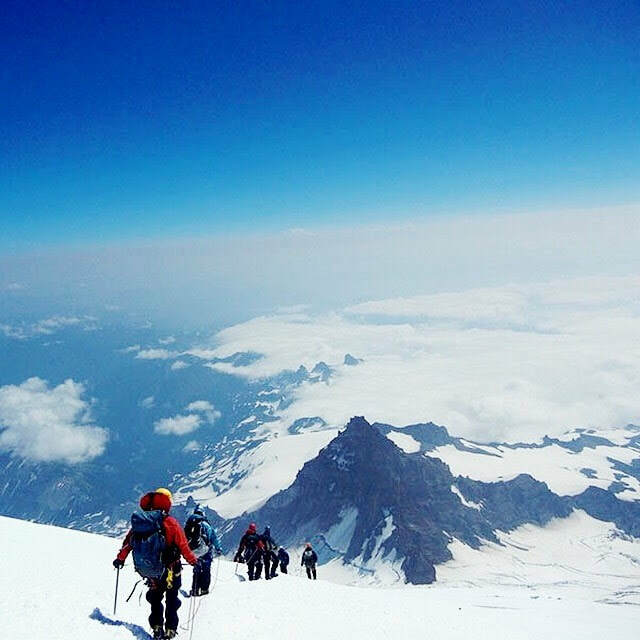 ​The best thing you could do to prepare for big mountain climbing is to go to altitude, go trekking to start with and see how you fair. 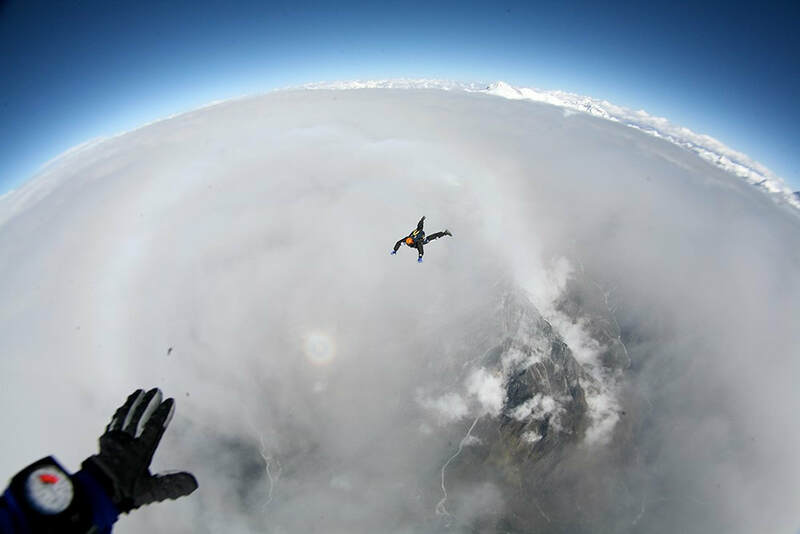 The only way you can know how you fair at altitude is to go there. Climbing Everest is a great test of strength and endurance but isn’t by any means the hardest of mountains out there, but it’s definitely the highest and that’s what’s really tough. 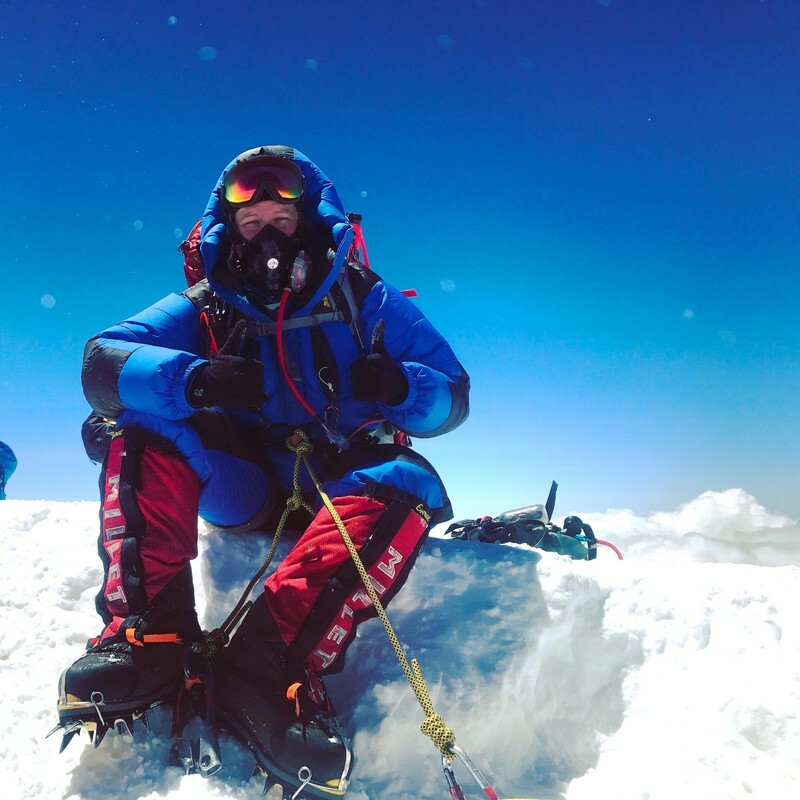 If Everest is your goal, get at least four or five big mountains (6500m+) under your belt first, to see how you go at altitude and build your skills and knowledge. For me, keeping a quiet mind is vital for climbing mountains. As there is a lot of repetition, I try and get into a rhythm and keep doing the same thing over and over, and that’s what it is, it’s a mind game. I have developed a personal technique, similar to slipstreaming used in other sports, where I will slip in behind my climbing partner and when they move their foot, I’ll move my foot and then we rotate after a period of time. It’s then simply one foot in front of the other. This takes away the mental mind games. If you start questioning yourself, ‘am I good enough?’, ‘why am I slower than my team?’, ‘why am I here?’, especially at high altitude, it starts eating away at your mind and it’s just exhausting. If you share the workload by shadowing each other, all those thoughts seem to diminish. It’s simplifying it, it’s taking away all that self-doubt. That’s what I did, all the way to the summit of Everest. The consequence of saying ‘Yes’ or ‘No’ on Everest, or any mountain, can be the difference between life and death. There is no autopilot. Every action has a reaction. It really is living in the moment and is definitely not for the faint hearted. 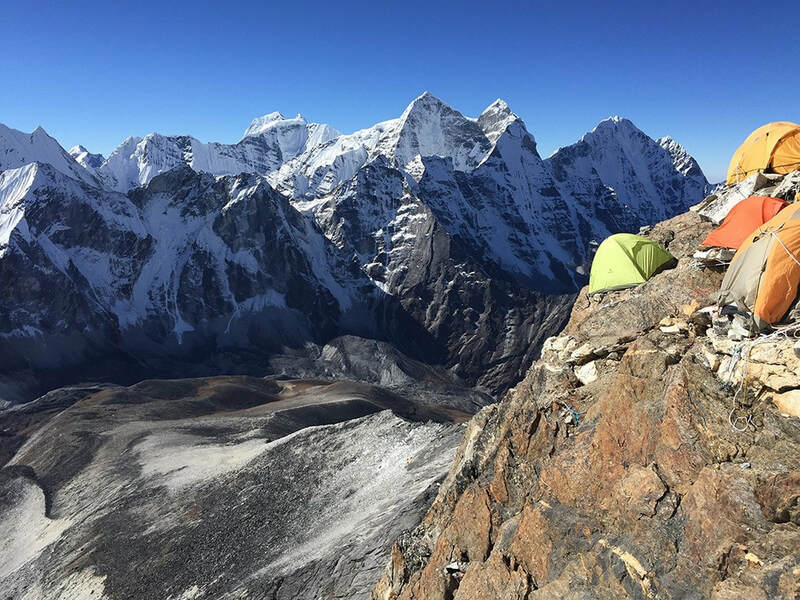 I spent 47 days on Everest above 5000m, living in a tent. My summit was bluebird with calm and crystal clear views. My descent was the opposite; terrifying with ferocious high winds. 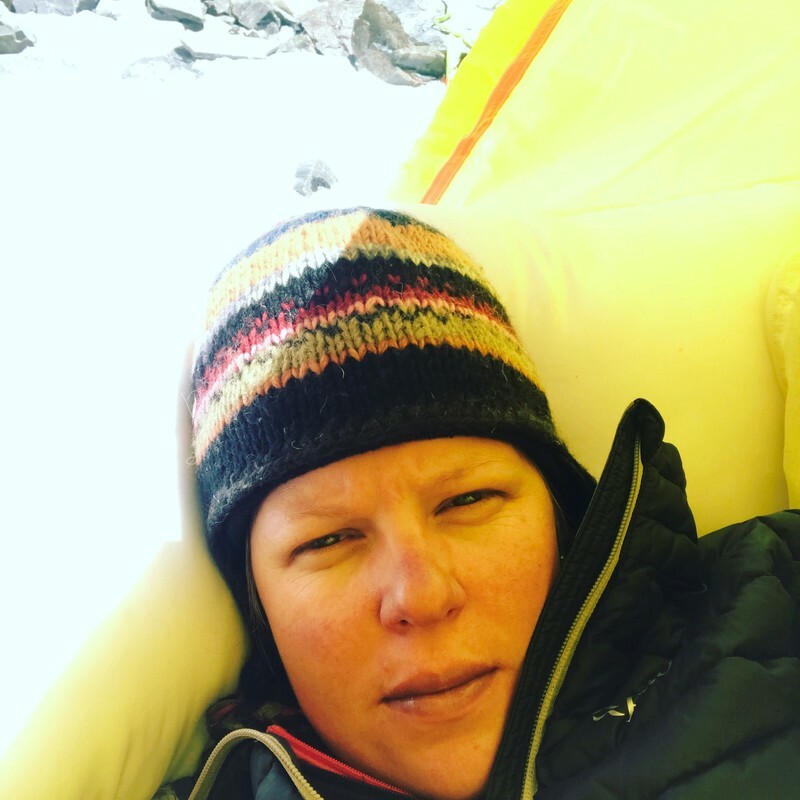 I got stranded in Camp 3 at 8300m for the night. I was one of only four tents left in tact. I often get asked, where is the ‘fun’ in climbing big mountains? It’s the endurance I’m drawn to, the challenge of seeing how far I can push myself physically and mentally. A positive mindset is without a doubt your best tool. ​On big mountains, the choice is simple: Do or die. Everyday on expedition is a personal challenge and a reward. Keeping warm and in good health are up there but it’s the little things like feeling constantly grubby, putting grubby clothes back on after you do finally wash, seeing a packet of wet wipes as a luxury item, ridiculously bad hair days, split and broken nails, trying to accurately pee in a bottle in the tent in darkness, eating hairy spam…. ​A positive mindset and an acceptance that nothing is luxurious, or even comfortable at times, is essential but the rewards are huge. The views, the fresh clean air, the midday sunshine are all spectacular but for me, the reward is knowing you can do it, knowing you can live for long periods of time very simply, without materialistic needs or big comforts and pushing yourself in ways you wouldn’t have thought possible before. Learning, growing and experiencing a whole different you is the biggest reward. Some people say you can’t or you shouldn’t, some say it’s impossible ‘for someone like you’, because you’re a woman. 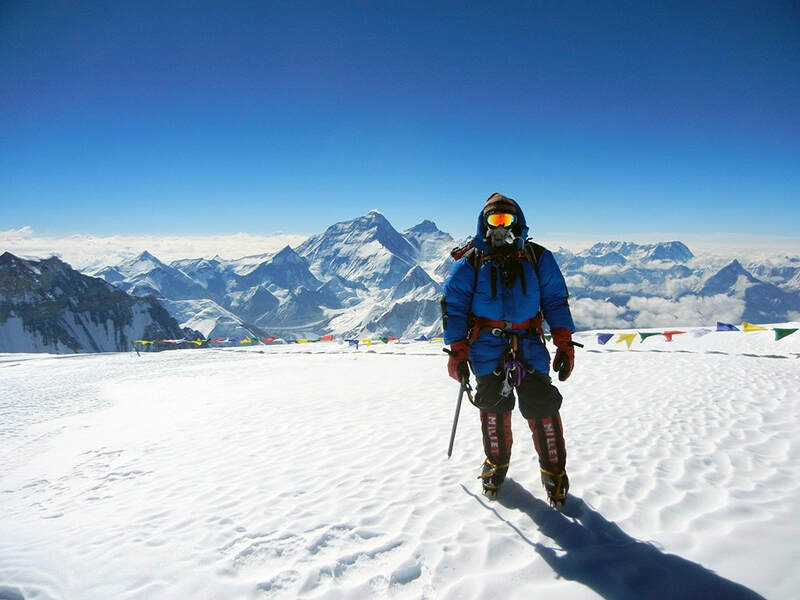 Recently I met a woman whose dream to climb Everest was not acceptable in her culture because she’s female. Her passion, however, is a powerful driving force against all the odds. Being passionate is key. Women are fantastic endurance athletes because we’ve kind of had that built into us. I think we’re incredibly tough creatures. ​Being the only women in an all male team of climbers on Everest was, at times, very challenging and feelings of isolation were often present. I feel strongly about the capability, yet lack of women on the mountain. I have found the higher the mountains go, generally the less women are on them. I am only too happy to champion the endurance potential of women. When you’re physically and mentality exhausted and there’s not a lot left, it’s good to have a little mantra. When I was doing nine hours of abseiling and rappelling off Ama Dablam, it really was life or death. There are so many ropes at the anchors and you have to make sure you are clipping onto the right rope. Some experienced mountaineers have died because they’ve clipped the wrong rope. You’re tired, there’s ten other ropes on there from previous years, so you’ve got to have a mantra, or a saying that keeps going around in your head. ​Mine was ‘lefty-loosey, righty-tighty,’ that’s it, just for opening the carabiner and doing it up repeatedly. Setting yourself up when you’re not tired is challenging but when you’re exhausted, you’ve got to be on your A game. On Everest and other mountains I have climbed, there is much time for contemplation and reflection. Here is an extract from my Everest journal giving a candid glimpse into my mind whilst waiting for a weather window before my summit push. “I’m feeling lots of mixed emotions right now. Why am I doing this? Is it really pointless climbing a massive lump of rock, ice and snow that is indifferent either way. Is this a ridiculously selfish endeavour? Why do I want to climb this mountain, or any mountain? It is fun? Or maybe I enjoy the mental challenge, sometimes physical suffering? Do I want to prove to myself I can do this? Is it the time and money invested thus far or maybe it’s the fear of failing that propels me from one day to the next… That is most likely it, trying to avoid the bitter disappointment of failure. The sting, the burn, the pain of turning around and walking away, even if it’s the right thing to do. Or is it the joy of succeeding that is my driving force? Those euphoric feelings of success and accomplishment we all crave, and some of us experience, especially when the odds might be against us? The gamble of the weather, the howling brutal winds, the eerie sounds of rocks falling around you, the ice melting. Everything is moving, nothing is stable. ​So where is the victory in climbing mountains? The mountain is never conquered and the weather is never defeated. In the words of Sir Edmund Hillary, “the mountain merely relents” to allow you a shot at the summit and is indifferent in your fate. For me, the victory was challenging myself to achieve my dream and facing my fears and weaknesses. It’s about the joy of experiencing, learning and growing with new skills and experiences. 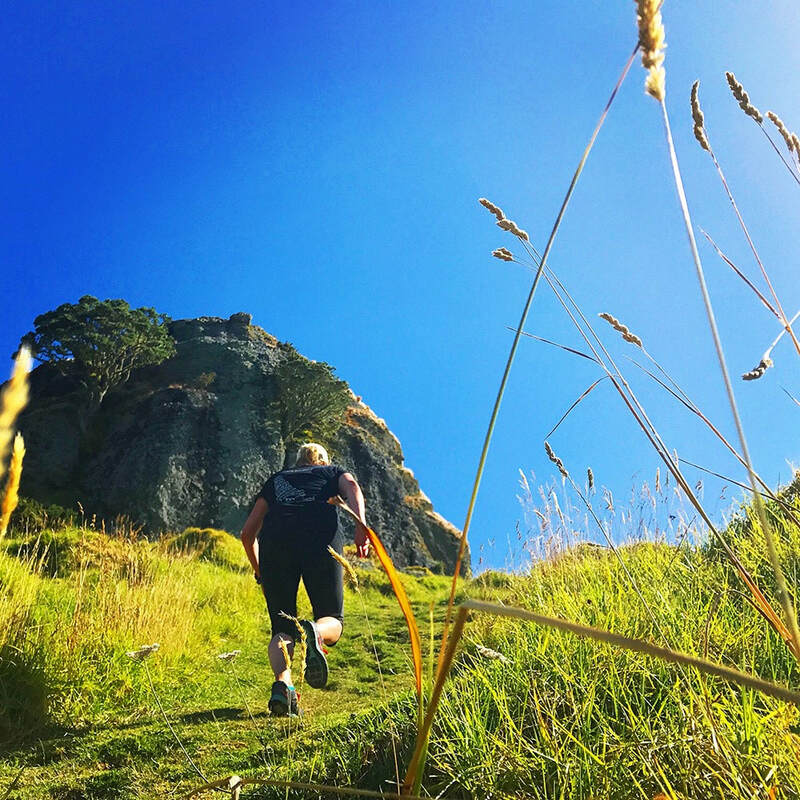 My mission is to daydream, meander, run, climb and jump into many more adventures of self discovery, and in doing so, knowing that with self-belief, determination and resilience, even the biggest of challenges can be overcome. ​Life passes most of us by at an incredible rate, so if you find your passion, grab hold of it with both hands, nurture it, improve on it and go climb ‘Your’ Everest. Her Everest journey at #EverestEveryday. ​​​​​If you want to get involved with Mountain Monday then click here for all information!